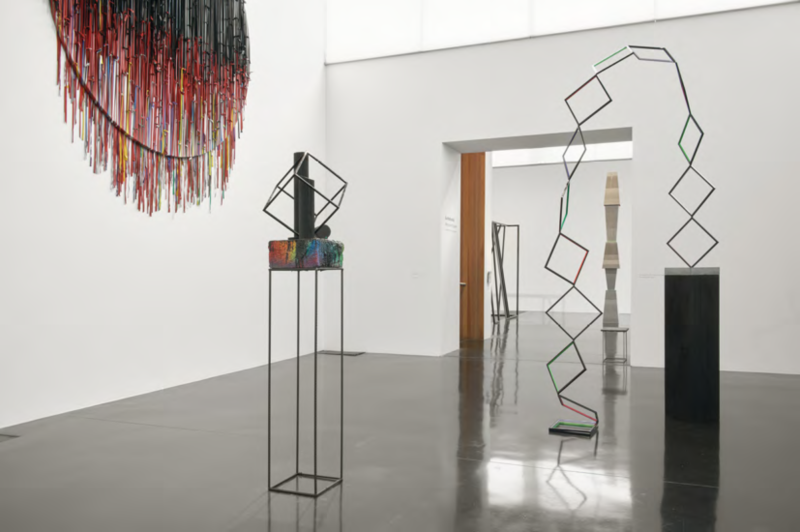 For two decades now, scarcely a year has gone by when Eva Rothschild has not been invited to make a substantial solo show somewhere in the world. In that time there have been hugely prestigious commissions such as the Kunsthalle Zürich in 2004, the Tate Britain Duveen exhibition in 2009 and the Nasher Sculpture Center in Dallas in 2012. In 2011 Rothschild had the honour of being invited to make the inaugural exhibition at the Hepworth Wakefield. She said to me once, some time before that show, that any woman sculptor in the UK had to shape up to the legacy of Barbara Hepworth at some stage – but I don’t imagine she had envisaged quite such a direct face-off. As it was, that show, Hot Touch, demonstrated the formal discipline and inventiveness of her work as well as its occasional playfulness. It also enabled a nuanced and intelligent conversation about sculpture and gender. The New Art Gallery Walsall is another gallery with a direct connection to a giant of British sculpture: Jacob Epstein. The gallery is home to the Garman Ryan Collection, the gift of Epstein’s widow Kathleen Garman and her friend Sally Ryan. Alternative to Power is the title of this show and the title also of the banner that occupies a vitrine looking out onto the street at ground floor level. Rothschild has made connections between the form of the work and trade union banners or political posters, and it is true that the direct address to passers-by is arresting. All the work in this exhibition, with the exception of one piece, has been made this year, and so it has inevitably been made against the background of the political upheavals in the UK over the summer, and the social, political and financial consequences that have played out since. On the second floor of the gallery, the exhibition occupies four interconnecting spaces, allowing the artist to create discrete groupings of works in dialogue with each other. Throughout, there are artist-designed stools, intended to encourage the visitor to sit and linger, to slow down the experience of visual consumption. Like the Hepworth Wakefield, the galleries have slender windows looking out onto the town, but Rothschild has chosen to cover these over in order to intensify focus on the works. 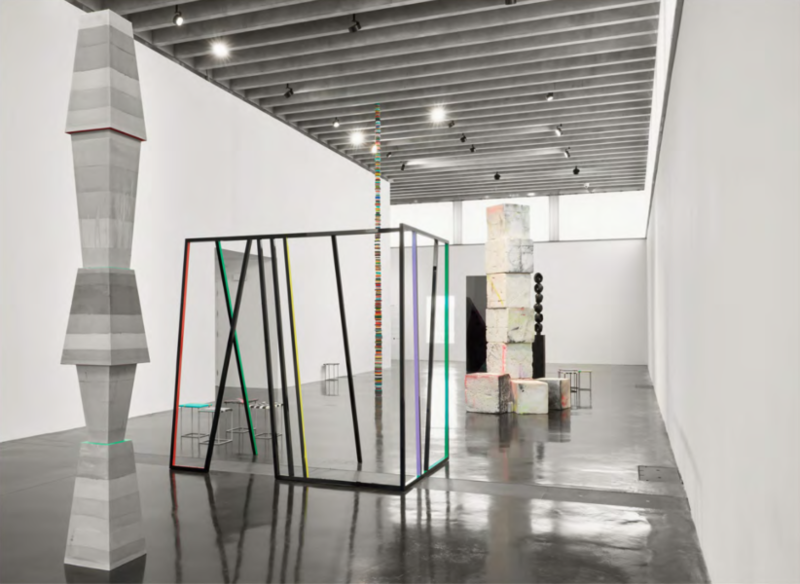 The lofty, double height galleries mitigate against any sense of confinement, and many of the works exhibit an exuberant verticality, appearing to revel in the freedom to soar upwards. Technical Support, 2016 is a slender column banded with colours that reaches into the rafters of the main space. 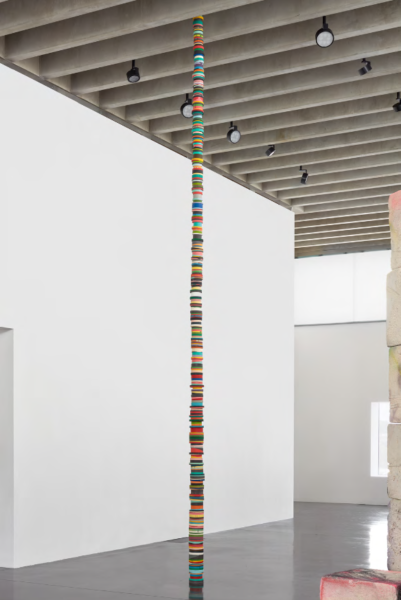 It borrows its form from the many reels of coloured tape that accumulated in the artist’s studio and, like Hi Riseand Tombstones, has something of the totem, as well as the architectural about it. 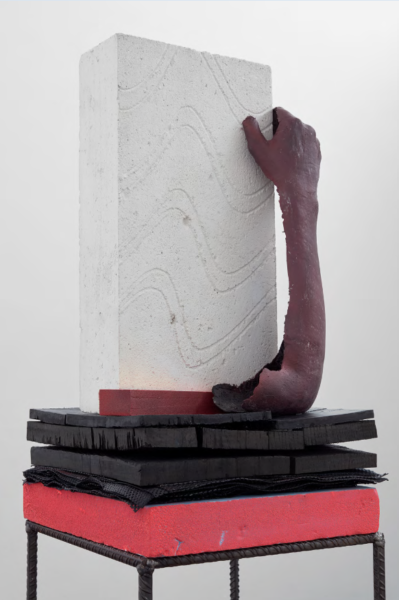 By casting found objects, Rothschild effects material as well as functional transformation: a work like Ruins, 2016 is constructed from casts of rough polystyrene blocks so that the viewer is drawn to interrogate the surface, while at the same time processing thoughts that the allusions here might be to ruins as disparate as Agrigento, Palmyra or Aleppo. 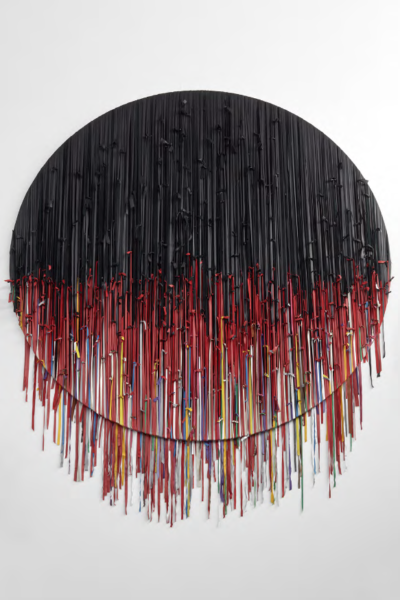 A word quickly about black: Rothschild has always made use of the densest blacks, whether in silkily powder-coated steel, softly gleaming leather, or mirror-polished acrylic. The various surface textures can trigger almost subconscious references (rock ‘n roll, punk, fetish) and this tactility is at the heart of her work. Thinking Arm, 2016 features a cast of the artist’s arm, literally placing the body of the artist, and her labour – mental and physical – at the centre of the work. 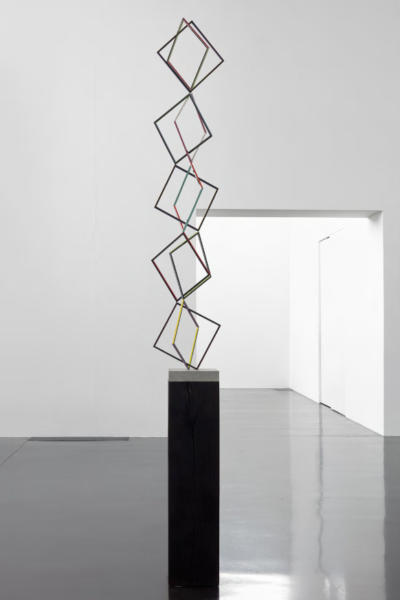 At the same time, in white cube spaces, the way she uses black produces a graphic effect that allows Rothschild to shake off the constraints of solid volume and instead extend form apparently weightlessly. 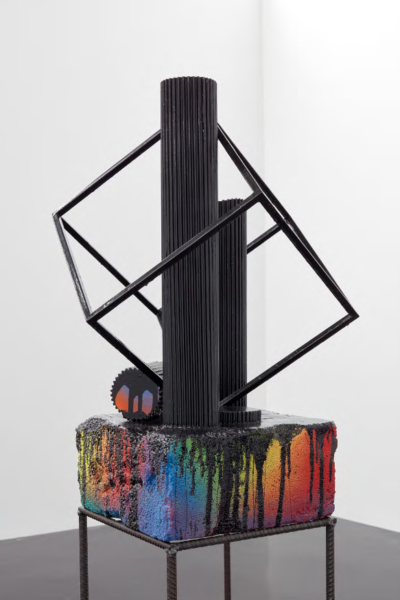 A work such as OverReach, 2016 springs off its plinth and arabesques gracefully towards the floor, while the three propped, frame-like sculptures called Gated Community, 2016 gleam sexily as they corral our looking through and around them. 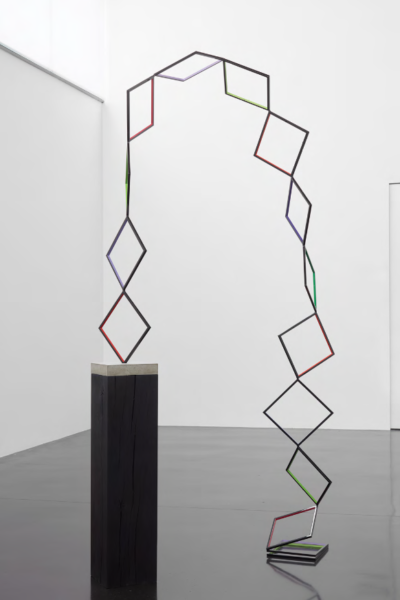 These three works in particular, with their slivers of mauve, green and red inside the black, engage ideas of the pictorial with the sculptural that nod to Anthony Caro’s great works of the early 1960s. This is a fantastically powerful show by one of the leading sculptors working in the UK now. It is wonderful that we have, in the New Art Gallery, a building of such great architectural quality to entice her come here to the Midlands to showcase important new work. The architects, Caruso St John, have just won the Stirling Prize for the Newport Street Gallery in London. As I write this news has just broken that the local authority may have to close the gallery to meet planned spending cuts. It is absolutely crazy. There must be some alternative.